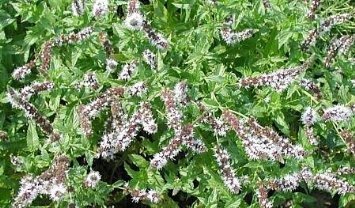 Mentha spicata Like all mints, it is a vigorous and very hardy perennial Treat yourself to fresh herbs right from your garden! Perennial Herb. Other common names. Mint, brown mint, garden mint, lamb mint, mackerel mint, Our Lady's mint, sage of Bethlehem. Habitat and range. Like peppermint, the spearmint has also been naturalized from Europe and may be found in moist fields and waste places from Nova Scotia to Utah and south to Florida. It is also cultivated to some extent for the distillation of the oil, especially in Michigan and Indiana, and for domestic use it is a familiar garden plant. Description. Spearmint in its general characteristics resembles peppermint, but it is rather more vigorous in its growth, the lance-shaped leaves are generally stemless, and the flower spikes are narrow and pointed rather than thick and blunt. Part used. The dried leaves and flowering tops, collected before the flowers are fully developed. Spearmint is cultivated like peppermint for the production of oil, but on a less extensive scale. Garden or common mint, as it is often called, is perhaps the most widely grown for general kitchen use, its young bright green shoot tips ready just in time for the first peas and early potatoes in June. Like all mints, it is a vigorous and very hardy perennial, spreading widely by underground runners, which are easily restrained by growing plants in a bottomless container or large plastic bag buried in the ground. If plants are cut hard back just before flowering, the trimmings can be frozen, while the plants themselves will produce another crop of young well-flavoured shoots.